Dean Howard catches some air during a recent ride on the mountain biking trails at Phil’s World, located east of Cortez. Time to dig in and hit the trail. Trails 2000 will kick off the spring season with an opening day of trail work Saturday. The trail construction project will be held at Phil's World near Cortez, in connection with the Cortez-based Kokopelli Bike Club. Work will run from 9:30 a.m. to noon with a barbecue to follow. A group trail ride will follow the barbecue. Participants should wear long pants, a long-sleeved shirt and sturdy shoes, and bring a hat, sunscreen and water. Advance registration for the work day is requested at www.trails2000.org. The trail project is for a new interpretive/practice loop at Phil's World, a popular mountain bike trail network. To reach the location, travel west on Highway 160. The parking area for Phil's World is located across the highway from the entrance to the Montezuma County Fairgrounds outside Cortez. 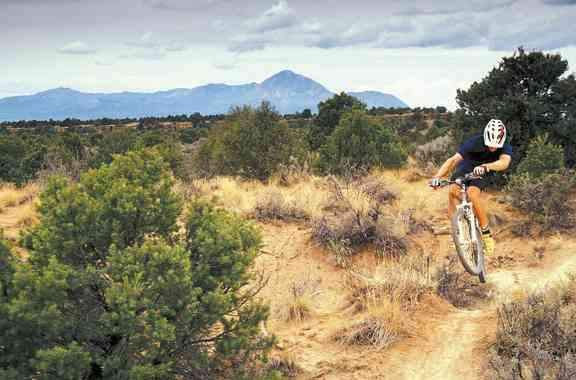 More than a decade ago, mountain bikers started to explore the area, located two miles east of Cortez. The area now offers more than 20 miles of desert/mountain singletrack on land controlled by the BLM and the State Land Trust. The State Land Trust portion is leased by the Kokopelli Bike Club, which helps maintain the trails. The club and Trails 2000 will work together on Saturday's trail work. The new skill-building trail was laid out with the help of the IMBA Trail Care Crews. It will offer four miles of minimal grade trail for all ages and abilities. A group of students from Montezuma-Cortez High School also has assisted in the current trail project. Currently, all completed trails at Phil's World are open and in excellent condition, according to Trails 2000.